Grey or black squirrels are a common sight in urban and suburban backyards. These sprightly rodents can drive homeowners to distraction when they scamper around in attics, chow down on beloved herb gardens, or hog food from backyard bird feeders. Give squirrels a home of their own: Grey squirrels nest in hollow trees or nests of leaves and twigs placed in the crotches of tall trees. 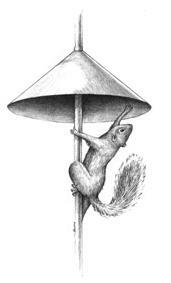 A good way to keep squirrels from nesting in your attic is to give them their own living quarters. You'll be surprised at how readily they adapt to living in backyard nesting boxes. One nesting box is enough for an urban backyard. For best results, build a modified version of the design provided in "Build and Maintain Nesting Boxes". Make a 7.5 cm entrance hole on the side, 10 cm from the top and 6 cm from the back edge. Drill ventilation holes in the side opposite the entrance. Half-fill the box with dry leaves or shredded newspapers to make it more enticing. Set the box out in the fall, as it will be most heavily relied upon in the winter. The nesting box should be placed in a tree 6 m to 9 m above the ground. The entrance hole should face south or east to be downwind from prevailing winter blasts. There's no need to clean the nesting box; the squirrels will use it year-round and are reliable housekeepers. Do a regular check to ensure that the structure is mounted securely and in good repair. Protect Feeders: As raiders of bird feeders, squirrels are inventive, acrobatic, and persistent, but there are tricks to discourage them from helping themselves. About 8 cm to 10 cm of aluminum flashing fastened around the bottom of the feeder should stop squirrels in their tracks. Commercial barriers are sold in many hardware or nature stores. They fit over hanging feeders to prevent squirrels that approach from above, and under pole-supported feeders to foil their forays from below. "Tumblers" will stop these acrobatic rodents from tightrope walking across wires to reach feeders. You can make them out of short lengths of plastic pipe fitted over the wires - the tubes will spin whenever squirrels try to cross them!